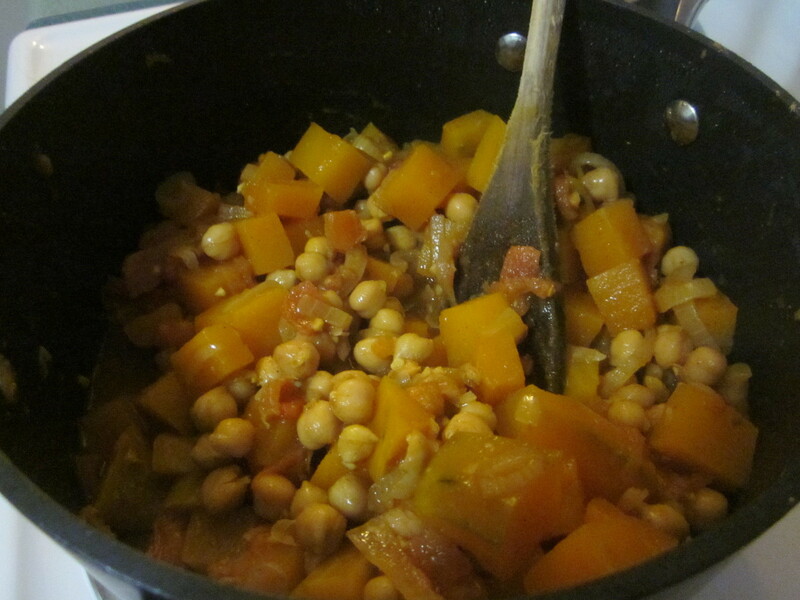 We’ve had a few cooler, cloudy days, which made me hanker after some nice hearty, winter fare, something with pumpkin. 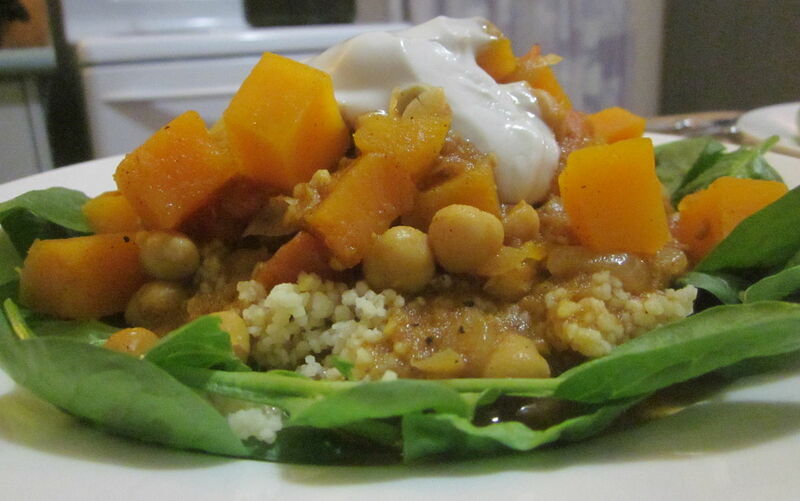 I came across a simple but yummy tagine recipe courtesy of Vegie Head which I almost followed exactly – that’s a rare thing for me! The onions I’ve been getting at the markets are incredibly strong and really hurt my eyes, so I made this earlier in the day when I could have the doors open to keep the onion fumes to a minimum. Heat oil in your tagine (or large pot – our tagine broke before we moved, so I used a large pot) over a medium heat. Add onion and garlic, and sauté until soft; about 5 minutes. Add cinnamon, turmeric, paprika and cumin, and stir to release fragrances. Pour in tomatoes, water and chickpeas. With the lid on, bring to a gentle boil, then stir, replace lid, and allow to simmer for 15 minutes. Check regularly and stir gently, adding more water as needed, 1 tbsp at a time. Add pumpkin and coriander and cook for a further 15-20 minutes, stirring gently. Serve over a bed of spinach and couscous, topped with coconut yoghurt, and cracked pepper to taste. The original recipe suggested vegan sour cream, but I didn’t have any, and I have to say the coconut yoghurt worked beautifully with it.